A simple guide to wireframing in easy diagramming software, including the user-friendly interface, advanced formatting tools and free templates. Edraw is a comprehensive diagramming maker that can generate various diagrams. It offers a super easy solution for creating wireframes, with the best combination of capabilities and efficiency. The interface is similar with MS Word so that users can operate the software without hassle. It is quite user-friendly because even beginners can handle it without learning a manual. 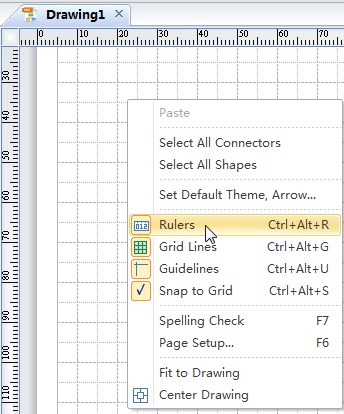 At the same time, Edraw includes advanced elements for easy and effective diagramming. Listed below are detailed introductions of the above mentioned elements. The canvas is used to see the organization of your full document and its content. 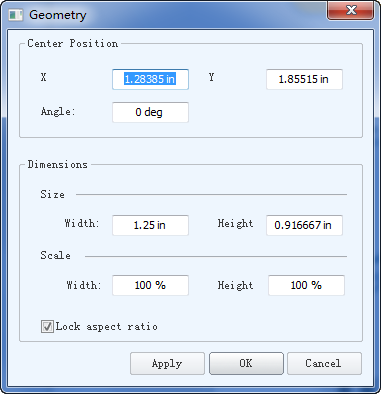 It include gridlines, rulers and guidelines for easy and accurate design. Shapes are your most crucial tool when creating wireframes. Edraw offers most necessary shapes for diagramming. The pretty basic shapes include rectangles, circles, and triangles. The specialized shapes for wireframing contain iphone, ipad and android UI icons. They are all pre-drawn shapes in popular vector format. Just drag and drop or copy and paste them to use. There are several properties you can change regarding a shape. See more about Edraw's shapes at this link: Features of Shapes/Symbols. You can add text within, below or above a shape as you like. Most of Edraw's shapes are designed with text boxes. Double click a shape to type in text. If a shape doesn't have a text box, you can add a text box to it. That text then acts as a property of the shape and moves in tandem with that shape. Several libraries are embedded in the program. A plenty of UI or website wireframe design shapes are contained. Every time you open a template or an example, the related libraries open automatically next to the canvas. Templates are documents that are already set up and ready for you to use. Make some modifications when necessary. 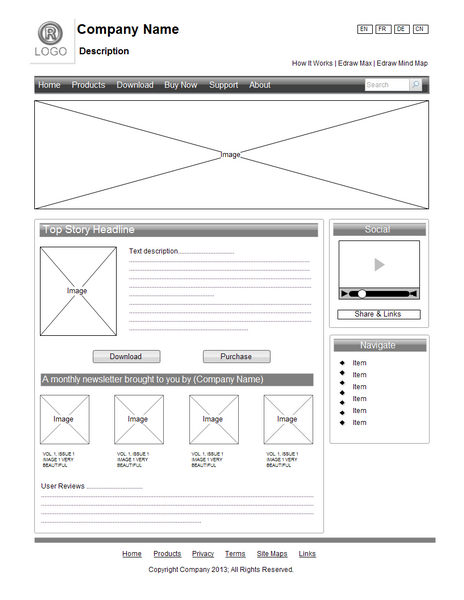 Wireframe design is very important in screen design process. It defines the information hierarchy of your design. It's important because it allows the designer to plan the layout and interaction of an interface without being distracted by colors and typeface choices. In Edraw's wireframe template, you can find all the symbols and icons used in site designing. With the smart tools and straightforward interface, Edraw offers the easiest way to plan the layout of a website. Click here to free download Edraw Wireframe Software. 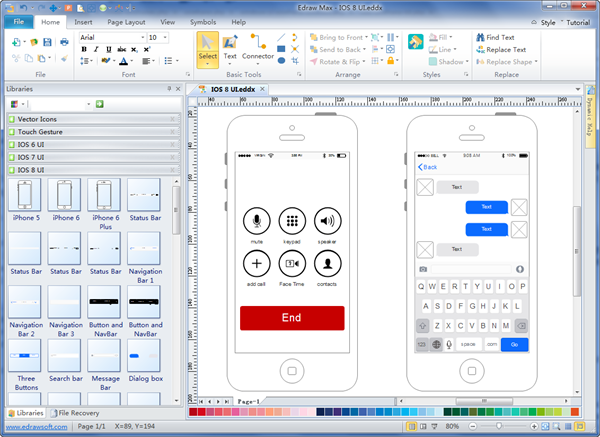 Then you can use the built-in templates to create and present wireframes quickly and effectively.